Automated isolation systems are becoming widely used to provide high integrity isolation solutions that improve productivity and reduce manual handling. process provides a safe methodology for electrical isolation it comes at the cost of production and potential manual handling issues due to the size and weight of the cables. can be applied to procedural safety and operational management. These automated systems provide immediate productivity improvements by removing the need to use a trained and competent electrician to complete the isolation, enabling isolations to be performed by operators and maintenance personnel, it also provides a decrease in manual handling of heavy cables and a minimisation of the time and travel associated with conventional manual isolation procedures. This underground mine had a distributed Remote Isolation System, which allows for isolations to be initiated and confimred from numerous locations. This Remote Isolation System is used for minor short duration tasks. Through a risk management process, the mine site determined that isolations could be effected using a specially designed High Integrity Isolation System (HIIS) for more complex, longer duration tasks. components in its control system. With this being the case, the HIIS was designed, tested, installed and commissioned in accordance with the functional safety principles and lifecycle outlined in AS/NZS61508. 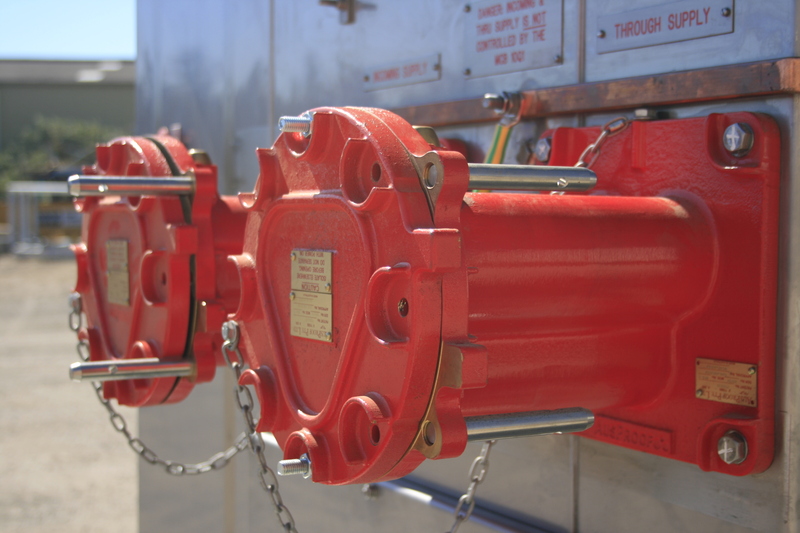 This change in isolation philosophy provided a single high integrity isolation point, located near the 11kV longwall face conveyor, which effectively and safely isolates the face conveyor and associated drives and allows the fulfilment of multiple personal danger padlocks to secure the isolation. The HIIS removes the requirement for electricians to perform isolations by physically removing heavy plugs. This allowed isolation and restoration of power to be performed by operators and maintenance personnel, saving valuable production time while achieving an effective and safe isolation. Find out more about this system below or download as a PDF. After the scope was defined, Ampcontrol developed a detailed design following their Functional Safety Management Plan which aligns with the requirements of AS/NZS61508. This included facilitating a detailed hazard/ risk assessment and Layer of Protection Analysis with the mine site as part of the process to meet the target specification of a dangerous failure rate of 1 in 100,000 years. The Layer of Protection Analysis showed that to achieve the desired safety integrity level the design required multiple independent E/E/PE systems to provide sufficient redundancy to achieve this target. 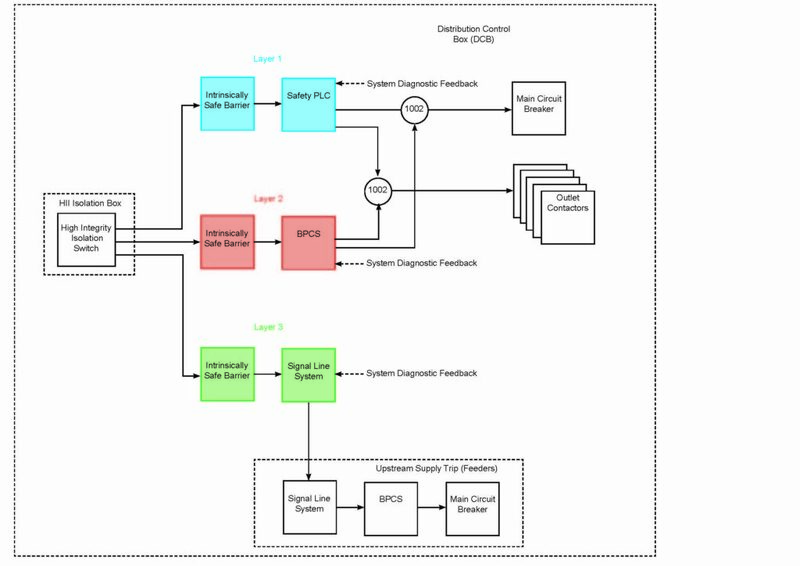 The final design consisted of three separate monitoring and control system layers to achieve the target failure rate, as shown in the Function Block Diagram (below) and subsequent Fault Tree Analysis. With the first layer being a SIL3 system and the second and third layers both being SIL1. The SIL3 system provides the primary level of safety protection which is operated by redundant inputs with fault detection from the High Integrity Isolation Switch. The PLC then disconnects power to the conveyor and longwall motors by opening the associated contactors and main circuit breakers via safety relays. The switching sequence and timing is utilised to ensure the isolation procedure has been effected properly in the required timeframe and the final step in the process is to affix personal danger padlocks securing isolation. The system includes many safety related products including an Allen Bradley Guardlogix PLC, safety relays, cable fault monitoring relays and controllers. In the event both the primary and secondary levels were to fail, a tertiary system is designed to disconnect the supply to the whole longwall system by opening the main upstream supply circuit breaker. This tertiary system is designed to SIL1 and consists of a signal line/ remote isolation system communication line to disconnect power upstream in the event any of the longwall contactors and main circuit breakers remain closed when they were commanded to open. Following design and installation in accordance with AS/NZS61508, the system design and calculations were independently assessed for compliance and a certificate was provided by the independent third party. Confirmation of the system operating as expected under all normal and abnormal conditions was undertaken by Ampcontrol’s trained staff using functional testing and the introduction of faults to confirm the adequacy of the design and manufacture and safe operation under all failure modes. From these tests a list of any possible dangerous undetected faults were compiled into a proof testing document which was developed in such a way to allow for non-invasive proof testing at the periodic proof testing intervals as required by the SIL analysis to allow the mine to maintain the SIL claim. This system is currently in operation and used for a range of maintenance tasks providing increased productivity and output by significantly decreasing isolation and restoration times at the mine site.